In Search of Wellness: What kind of person do I want to be? In which I present an essay by Matt Ball of Vegan Outreach. His title is "Is Being a Vegetarian Important?" The title I give it is "What kind of person do I want to be?" As an activist, it's been very difficult being sick--which has meant not being active. And what is an inactive activist? I'll write more about illness and identity later. For now, I give you Matt Ball. Is Being a Vegetarian Important? Have you ever been in so much pain that you thought you were going to die? Have you ever suffered so much that you wanted to die? Every year, hundreds of millions of individuals in the U.S. do suffer to death. Slowly. Excruciatingly. Egg-laying hens packed in tiny wire cages, unable to move because of how crowded they are, can have their wings or necks stuck in the wires, keeping them from getting to food or water. Pigs, transported hundreds and hundreds of miles in all weather in open trucks without food or water – can freeze to death. Chickens raised for meat, bred to grow so large so fast that their legs break under their own weight, leaving them incapacitated and unable to get food. An hour before I was planning to leaflet, a friend of mine called and said that he had spotted a stalled transport truck with a downed dairy cow inside. Our poor friend died that day, on the filthy floor of a bloody transport truck. We witnessed her body go cold, and her eyes stop moving. Her entire life had been enslaved and twisted by violence and prejudice. Words cannot convey the horrifying conditions that bring about these slow, agonizing deaths – how the animals are bred, how they “live” on factory farms, and, for those who survive the brutal system, how they are butchered in industrial slaughterhouses. No verbal or even video description can begin to capture it; even visiting these confinement warehouses and slaughterhouses can’t begin to convey what it is like to live one’s entire life there, to be callously killed in the end. This is the system we endorse and support when we purchase its products. Consuming flesh foods from modern agribusiness not only pays others to exploit and butcher fellow feeling beings; it not only affirms the view of animals as unconsidered cogs in the machine of profit; but our purchases are what give agribusiness the resources needed to grow and brutalize more of our fellows. This is enough to compel me to be a vegetarian, to make a daily, public statement against the breathtaking viciousness behind meat, eggs, and dairy. For me, being a vegetarian is not the conclusion of an impartial set of utilitarian calculations, nor the endorsement of “animal rights.” Rather, being a vegetarian is a statement about the person I want to be: that I could not live with myself if I were to be a part of such unwatchable cruelty to animals. The phrase is: How could I look at myself in the mirror? And that is literally how it happened for me – looking in the mirror and realizing I couldn’t consider myself a “good person” if I continued to pay others to brutalize animals so I could eat them. But of course, not everyone makes this choice. With factory farms concealed and society structured around eating faceless meat, we can easily refuse to take a stand and set ourselves apart. And if confronted with the hidden realities of modern agribusiness, we can seek out the “less bad” and call it good. For example: Michael Pollan, quoted earlier, not only isn’t a vegetarian – he actively mocks the “moral certainty” of vegetarians. He fabricates fantastic rationalizations to continue eating animals. For example, he says that thinking in terms of individual animals is human-centric, and that we need to think in terms of species’ interests. Of course, this is exactly backwards. “Species” is a human construct, an abstraction that inherently can’t have interests. Only individuals have the capacity to experience pleasure or suffer pain and thus have interests. That we should eat the flesh of our fellows to advance the “interests” of a species is so absurd, such a perfect inversion of reality that it is truly stunning that an otherwise seemingly intelligent person would be willing to spout such ridiculous nonsense. Pollan is the perfect example of Cleveland Amory’s observation that people have an infinite capacity to rationalize, especially when it comes to something they want to eat. Pollan’s unwillingness to seriously consider vegetarianism, combined with his firsthand experience of “our own worst nightmare,” leads his rationalizing capacity to praise “happy” meat from “humane” farms. Having had the time and resources to investigate the various farms available, the pinnacle of Pollan’s praise is Polyface farm, where “animals can be animals,” living, according to Pollan, true to their nature. So what is Polyface like? Rabbits on the farm are kept in small suspended-wire cages. Chickens are crowded into mobile wire cages, confined without the ability to nest or the space to establish a pecking order. Pigs and cattle are shipped year-round in open trucks to conventional slaughterhouses. Seventy-two hours before their slaughter, birds are crated with seven other birds. After three days without food, they are grabbed by the feet, up-ended in metal cones, and, without any stunning, have their throats slit. This is the system Pollan proclaims praiseworthy. While mocking vegetarians, he argues we should ethically and financially endorse Polyface’s view and treatment of animals. But really, how can we expect better? In the end, Polyface’s view is the same as Tyson’s – that these individual animals are, ultimately, just meat to be sold for a profit. It is logically and emotionally impossible for there to be any real respect, any true, fundamental concern for the interests of these individuals when these living, breathing animals exist only to be butchered and consumed. If we insist that we must consume actual animal flesh instead of a vegetarian option, it is naïve, at best, to believe that any system will really take good care of the animals we pay them to slaughter. If you say an individual is just meat, they will be treated as such. In the end, it really is a question of what kind of person we choose to be. Or, to think about it another way – what is the narrative of our life? Is it that we oppose cruelty or support slaughter? Do we make our own decisions or do we rationalize what we’re used to doing? I ask you to consider one more thing. The average American consumes about three dozen land animals every year. By choosing to be a vegetarian, you will accomplish a great deal of good over the course of your life – you will spare many hundreds of animals from the malicious maws of modern agribusiness. But get this: Tomorrow, you could accomplish much more, in just one hour! This may sound like an informercial scam, but it is true – for every person you convince to go vegetarian, you double the impact of your life’s choices. So, if tomorrow you hand out 60 booklets to new people, and just one person decides to go vegetarian, you will have saved, in only one hour, just as many animals as you will save with every single choice you make over the rest of your life. In other words, if we agree that being a vegetarian is important, that standing up and speaking out for the animals and for ourselves is crucial, then we must also recognize that being an effective advocate for the animals is many times more important. Efficient outreach has truly enormous potential; if you think compound interest is a good deal, effective vegetarian advocacy allows for exponential returns! When I was a teenager, my greatest ambition was to one day be a millionaire. [Later] I adapted the millionaire concept for purposes of activism.... I wanted to [keep] a million animals out of slaughterhouses.... But is it realistic to think that a typical person could keep a million animals from slaughter? Absolutely! ... At two thousand [land] animals saved per new vegetarian, this means that during your life, if you convince five hundred young people to become vegetarian, a million animals will be saved. With a reasonable level of investment, each one of us can do this. You don’t need to start a group. You don’t need to pass a law. You just need to make the choice to join with the others who are writing their own narrative, who are working for something bigger than just themselves. We can provide you with lessons from decades of experience and all the tools you need. Vegan Outreach exists to help everyone and anyone, in every situation, be the most effective advocate possible for the animals – for a world not just a bit less bad, but for a fundamentally better world. Leaflets don’t print themselves, however. Vegan Outreach is dependent upon the financial support of those who recognize the importance of effective advocacy. There are many demands on our limited time and money, and we must choose to invest our scarce resources to do the most good. Working to expose and end the hidden horrors of factory farms is, we believe, the best possible investment. Every new vegetarian pays dividends every year, in terms of their food choices and the example they set for others. 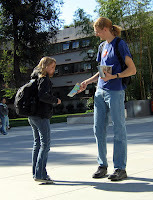 In 2007, Vegan Outreach distributed 1.8 million booklets – 56% more than 2006. 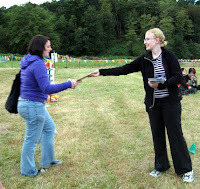 This was only possible because, from fiscal year 2006 to 2007, contributions to Vegan Outreach also rose exactly 56%. A donation today will lead to more booklets to more people tomorrow, which will lead to new vegetarians and myriad animals spared this year and every year! In the end, in our hearts, we know that, regardless of what we think of ourselves, our actions reveal the kind of person we really are. We each determine our life’s narrative. We can, like most, choose to allow the narrative to be imposed on us, mindlessly accept the current default, follow the crowd, and take whatever we can. Or we can actively author our lives, determining for ourselves what is important. We can live with a larger purpose, dedicated to a better world for all. The choice is fundamental. The choice is vital. And the choice is ours. In November 2007, I got sick and didn't get better. Many doctors later, I was finally diagnosed with chronic fatigue syndrome and, later, Lyme disease. This blog is my way of keeping family and friends updated on my journey towards wellness.